Simple PDF Merger is a compact and easy to use application that helps you to create a single document from multiple PDF files. You can add an entire folder of documents and join them with just a single click. The application allows you to change the order of the pages and to specify the name and destination of the output file. 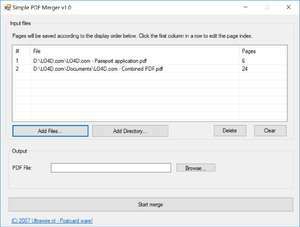 For security reasons, you should also check out the Simple PDF Merger download at LO4D.com which includes virus and malware tests. Additional screenshots of this application download may be available, too. Simple PDF Merger has a presence on social networks.